India is a land of mystique where shades of timelessness permeate everywhere. This is evident in the bullock carts that meander slowly down the paved highways, almost oblivious to the air-conditioned buses and monstrous trucks that surge past; experienced in the cave shrines of Ellora and Ajanta where prehistoric religious art instill an eerie awe in admirers; visible in the thousand-year old sculpted pillars of the Lingaraj temple at Bhubaneshwar; and enjoyed at the annual ritualistic re-enactments of the fabled marriage of Lord Shiva, a tradition that has been passed down for centuries. But while ancient palaces, monuments, temples, and other remnants of the past represent a major component of the travel experience of India, this land of one-sixth of the world’s population offers “sybaritic” pleasures as well; palm-fringed beaches line Goa, mountains and hills project the divine beauty of the snowcapped Himalayas, and babbling streams, lakes, pine forests, and tropical jungles provide an outdoor playground for both wildlife animals and tourists alike. Geographically, India is shaped like an upside-down pear with its tapered end dipping into the Indian Ocean. Its landscape is as rich as its history and culture. This country holds ancient traditions that date back 50 centuries. For just as long, India has been the bridge between the western values of Europe and the ideals and philosophies of Asia. Today, India is the world’s largest democracy. It is the home of more than 1.1 billion people who live in the world’s seventh largest country. India is most famous for its ancient temples, palaces, and monuments. The most famous is the Taj Mahal in Agra. The Taj Mahal is the world’s best example of Mughal architecture and is not only the “jewel of Muslim art”, but considered one of the seven modern wonders of the world. It is a mausoleum with an iconic white domed marble. The temple was commissioned by Mughal Emperor Shah Jahan, who was griefstricken by the death of his third wife and was inspired out of love to commission the Taj as a mausoleum. It was completed in 1648 after 17 years of construction. Other famous monuments and sites include the extravagant Amber Palace nestled between a rocky mountain gorge and a lovely lake near Jaipur; the Jama Masjid in New Delhi, which is the largest mosque in India; the Qutub Minar in South Delhi, the tallest brick minaret in the world standing 238 feet high; the Lingaraja Temple in Bhubaneswar, which is a Hindu pilgrimage center with lavishly decorated sculptures more than 1000 years old; the Black Pagoda in Konarak, which is the most beautiful temple in India, dedicated to the Hindu god Surya; and the prehistoric rock-cut cave temples of Ajanta and Ellora, which both feature 2,000 year old religious paintings depicting tales of Hindu and Buddhist significance. There are also several more famous temples that can be found in the state of Orissa. In Calcutta, colonial buildings can be found in Chowringhee. Chennai (or Madras) has several tall buildings and old Christian churches. India has more than 70 national parks, 400 wildlife sanctuaries, and 25 tiger reserves. Wildlife include Bengal tigers, Asian elephants, Asiatic lions, Indian rhinoceros, white-rumped vultures, water buffalos, striped hyenas, macaques, leopards, red pandas, black bears, rare dung beetles, and purple frogs. The best parks and reserves for viewing are the Sundarban National Park in West Bengal and the Bharatpur National Park in Rajasthan. India has some resort-lined beaches. The finest beaches are in Goa and the luxury resort of Aguada. The second largest beach in the world is found in Chennai with the Marina beach. 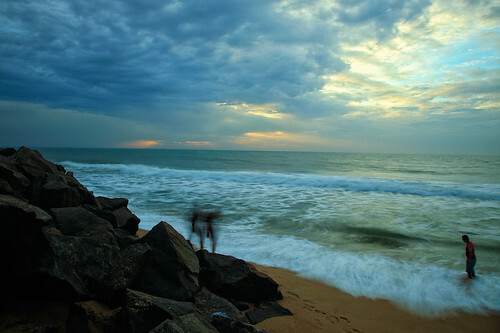 Kovalam also has a famous beach. In Mumbai, Chowpatti and Juhu draw the most visitors. India, of course, offers great opportunities for mountaineering and trekking. Trek the Kullu Valley from the base of Himachal, the Uttar Pradesh from the base of Kumaon, or the Tamil Nadu from the base of Kodaikanal. The mountains of Sikkim have the best mountain climbing in India, highlighted by the 28,169 feet Kanchenjunga – the third highest mountain in the world. There are ski resorts in India. The Gulmarg is the most famous one; it is complete with modern gondolas. In the summer, Gulmarg treats golfers with the unique experience of the highest golfing in the world. The best scuba diving and snorkeling is around the Bay of Bengal in the Andaman Islands. This archipelago is lushly forested with exotic plants and diverse tropical fish and corals. Romantic lakes in India include Lake Dal, where houseboats line the shorefronts and visitors are treated to a scenery of flower-spangled meadows and icy mountain peaks that has been described as “paradise on earth”. The romantic Udaipur is centered around Lake Pichola and its famous hotel, Lake Palace. The city has been hailed as the “Venice of the East”. To view the country’s jungles and forests, visitors can take the “Toy Train” from Calcutta. The train travels through the jungles and forests, reaching Darjeeling. Along the way, passengers can enjoy spectacular views of the Kanchenjunga mountains where Sherpa Tenzing died. To experience India’s desert, Pushkar holds a November Camel Fair while Jaisalmer in Rajasthan hosts a Desert Festival in January. India’s north is dominated by the world’s greatest mountain range, the Himalayas, which flaunts more than 145 peaks – about 40 of them rise higher than 25,000 feet! The Himalayas feature snowy plateaus near Tibet, as well as lush tropical jungles set in the foothills. Three great rivers traverse the north: the Ganges, Indus, and Brahmaputra. The Ganges is considered the holiest of the Indian rivers, with its fertile Gangetic Plains supporting a large population. The extreme northeast is the frontier between India, China, and Myanmar. This is a region comprised of the Naga, Lushai, and Chin Hills, where thick and impenetrable jungles are inhabited by tribal peoples who have long been isolated from the rest of India. In the interior, India consists of the Vindhya Mountains, which pose as a barrier between the north and south, cutting off one from the other. Even today, the north is culturally distinct from the south. India’s south consists of two mountain ranges, the Western Ghats and the Eastern Ghats, both of which meet in the Nilgiri Hills. The three great rivers running through the south include Godavari, Cauvery (Kaveri), and the Kistna (Krishna); all of them vary in volume depending on the season. The climate in India varies depending on the region. In the north, winters are mild thanks to the tempering effect of the Himalayan katabatic winds, which also make the summer as hot as the rest of the India despite the higher latitude. Central India is very tropical year-round. During the summer months, most parts of India average temperatures of 40ºC (104º F). The coasts, however, are slightly cooler at around 30ºC (86º F) but have higher levels of humidity. The Thar desert region in the west is hotter, averaging summer temperatures of over 45ºC (113º F). In the winter, India’s southwest is hit by monsoon rains thanks to low-pressure systems created by the Thar Desert. The monsoon progresses north and eastwards, reaching the northern and eastern regions in the early summer months. Winter temperatures in India range from mild in the north to warm in the south. Some parts of the Indian plains experience freezing temperatures that are as low as -45ºC (-49º F). The first known civilization in India dates back to 2500 BC along the Indus River. Around 1500 BC, Indo-Aryans migrated to India and conquered various parts of northern India. They developed Hindu religious beliefs and instituted the caste system. Around 600 BC, the religions of Buddhism and Jainism were born. Shortly afterwards, India was invaded by the Persians. The Persians were followed by the Greeks led by Alexander the Great in the 4th century BC. The first great Indian empire was the Maurya Empire around 325 BC. The empire revolved around Buddhism. Several cave temples and shrines were built. India’s golden age lasted from 300 to 500 AD during the Gupta Empire. Science, literature, arts, and wealth defined this period. Hinduism became the entrenched religion of India during this era. After the Gupta Empire collapsed, numerous small kingdoms sprang up. They fought each other until India was invaded by the Arabs and Turks. In 1206, the Turks established a kingdom in Delhi. Muslim rulers reigned over large parts of northern India. In 1526, the Mughals from central Asia migrated and built a great empire based out of Agra and Delhi. The Mughal Empire flourished until the early 18th century. During this period, European powers such as the Portuguese, Dutch, English, and French all set up trading stations in India. After the collapse of the Mughal Empire, the British emerged as the colonial power in India. For the next century, the country was patrolled and governed by the British. Armed revolts were repeatedly crushed. Indian nationalism grew as a result of British rule. In the 1920s and 1930s, Mohammed Ali Jinnah led a nationalistic movement that called for a separate sovereign state made up of Muslims. Simultaneously, Mahatma Gandhi led an independence movement that called for nonviolent campaigns against the British. Gandhi’s strategy paid off. Britain withdrew in 1947 and established two independent countries, India and Pakistan, with the latter comprised of the Muslim majority Jinnah called for. Since independence, India has had mixed success attempting to modernize. Despite a political democracy, the country lacks efficient infrastructures. The 1980s saw India grow economically at a steady rate, but growth stalled in the 1990s when the nation was hit with extreme unemployment. The gap between the rich and poor in India continues to widen and is one of the major problems facing this nation today. Gokhale, B.G. “India.” Lands and Peoples, Volume 2. Danbury: Grolier Educational, 2001. ISBN: 0717280225. Maniar, Bina, and Hugh Gantzer. India. New York: Prentice Hall Travel, 1993. ISBN: 0671879103.